Unlike many Canadian improvisers, François Carrier is no homebody. Peripatetic, the Montreal-based alto saxophonist spent months gigging in Italy and England, was one of the few Westerners to play the Kathmandu Jazz Festival, and most recently has put out discs recorded during his 2010 Russian concert tour. 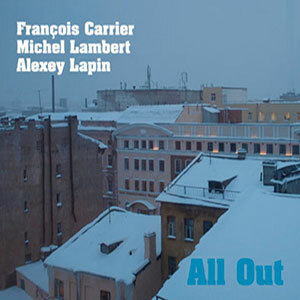 A session such as All Out (FMR CD 321 www.fmr-records.com), recorded with his long-time associate, Toronto drummer Michel Lambert, and St. Petersburg pianist Alexey Lapin, is not only notable musically, but also shows how erudite players from two of the world’s northern hemisphere nations have much in common. Carrier’s reed strategy includes elements of Cool Jazz note gliding as well as avant garde dissonance, and the Russian pianist constructs proper responses with alacrity. Ride, for instance, leaves the bomb dropping and clattering to Lambert’s kit as Lapin’s multi-fingered kinetic runs syncopate alongside Carrier’s spiky vibrations and false-register nasality plus dexterous explorations in the tenor register. Despite the saxophonist squeezing out multiple theme variants until he reaches conclusive downward runs, Lapin stays the course with unflappable chording as the drummer balances both men’s lines with military precision. In the solo spotlight, Lambert approximates the power of Art Blakey on Wit with cross-sticking rim shots and bass drum thumps, the better to later mix it up with Lapin’s dynamic cadenzas plus Carrier’s stuttering rubato lines and quivering split tones. The percussionist also asserts himself on Of Breath with a mallet-driven solo of whacks, bangs and ruffs, leading to the crescendo of high intensity further propelled by Lapin’s metronomic pulsing and Carrier’s flattement and triple tonguing.